This fabulous three bedroomed luxurious and modern beach house sleeps 8. It is ideally located right between the river, Torakina Beach and the main surfing beach, while also a very easy walk to shops, restaurants and the famous Hotel Brunswick. 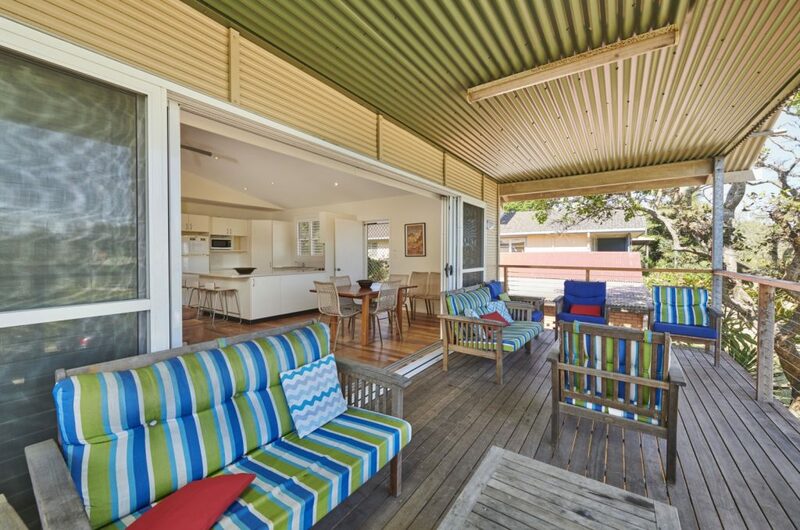 Sandrift features include open plan kitchen/dining/lounge area opening to a large deck overlooking the park and river, main bedroom with ensuite and a walk in robe. There is a second bathroom with separate shower, bath and toilet, polished timber floors, ceiling fans throughout and lock-up under cover parking for two cars. Entertainment includes a TV and DVD player in the lounge area and in the main bedroom. There is a BBQ to enjoy after a long day at the beach and a carport area under the house. This property is ideal for children and adults. Bookings under 7 nights will not be accepted until 2 weeks prior to the desired dates. Bookings during Off-Peak and NSW School Holidays can only be secured 7 months in advance. Bookings during QLD School Holidays can only be secured 2 weeks in advance.